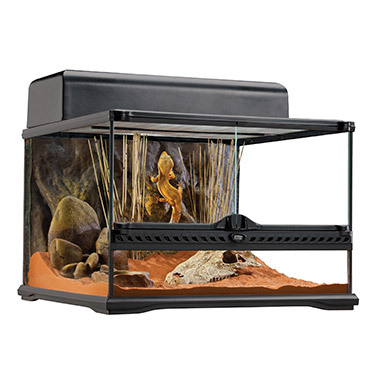 This low-profile terrarium (30 cm/12") is ideal for ground-dwelling reptiles and amphibians. Desert reptile species will really benefit from the vertically low design, as the ultraviolet and heat bulbs are located closer to the animal compared to higher models. This habitat is specially designed for desert setups, since most desert species are ground dwellers and do not move vertically. Although very similar in shape and size as aquarium-type tanks, this model has all the great features of our bestselling Exo Terra terrariums.